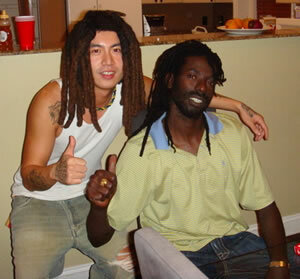 At a time when most of the most of the media coverage of Korea has been foreboding; Korean based Reggae artist Skull, is spreading good vibes and making history by building an unprecedented following in the United States with the release of his first single, "Boom Di Boom Di" and accompanying 3-D animated video http://vids.myspace.com/index.cfm?fuseaction=vids.individual&videoid=2025458205 will be available on iTunes June 12th. Jah B of WILD 98.7 Tampa, "Skull is the future of Reggae, In all my years hosting Janus Landing, I’ve never seen an audience embrace an opening act the way they did Skull at the Buju Banton show. Boom Di Boom Di is hot, hot, hot…and I expect it to be in heavy rotation here by Summers end." Skull, whose record has been buzzing in the Islands and on IRIE FM in Jamaica, is recently back from several weeks in Florida where he hosted WILD 98.7 "Reggae Spin" in Tampa, Florida, opened for Buju Banton at the legendary Reggae venue, "Janus Landing" and was a special surprise invited guest at The Marley’s Myspace Secret Show in Miami. Skull’s upcoming collaborations include Kardinal Offishall and Buju Banton. There are also rumblings of a rumored feature with Mariah Carey whose brother, Morgan is helming Skull’s career in the States.